Here was one of the many great moments in DKL 5. 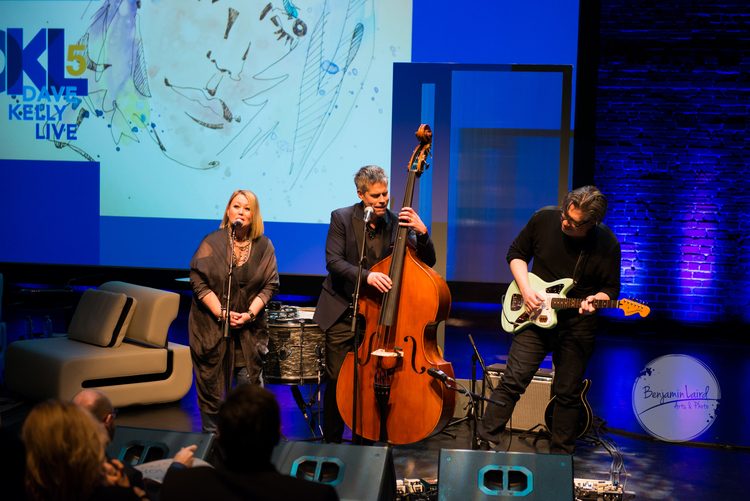 Jann Arden doing a duet with me, accompanied by Russ Broom. And the reason the great moment happened is because Jann Arden said yes, Russ Broom said yes, but mostly this moment happened because Russ Broom suggested masking tape. Without that, the entire thing would not have happened. I first met him on a morning TV show I was hosting during the Calgary Stampede a long time ago. I don’t remember what band he was with at the time, but I know it was during Stampede because also on the show that day were the Super Dogs. Super Dogs is a show that you can go see during the Stampede where they have really well-trained dogs put on a show of agility, speed, and obedience, all racing to music… I think. I’ve never actually gone to see the Super Dogs. But it was definitely Stampede and they had brought a few Super Dogs onto the show and we had improvised an agility course/race for two of the dogs to participate in. Run around this camera, run over these cables, race out the front door, back in the side door, jump over this guy lying down, go through a hoop, and finish. I know Russ was there because he was the guy lying down. I remember because I was a little bit mortified. Even before I met him, I idolized Russ, and somehow one of our crew convinced him that, what the hell, while he was here and the soundcheck was done, why not be an obstacle for the dog race. He laughed and said, “Sure – that sounds hilarious.” So the guy who’s played on platinum albums is now lying on our floor while dogs jump over him. Like I said, I was mortified. Fast forward to a few weeks ago and I have this idea. I think it would be hilarious during Dave Kelly LIve if I convinced Jann Arden to sing a song with me. Now, I had asked Jann if she would come on the show and she generously said yes. However, she didn’t want to bring a guitar and didn’t want to perform. Which I totally understood and agreed to. She might be a platinum-selling recording artist, but I also know she’s a hilarious interview, so having her come down and just talk with me would be great. I also knew, though, that no matter how many times I said, “Jann Arden is coming on Dave Kelly Live for a conversation,” that there would be a certain number of her fans that would show up thinking she was going to sing. So I got an idea. I would find a goofy reason for her to sing a duet with me. This was my plan. I would sing one of her songs. Then make it so ridiculous that she would smile, laugh and then walk over to the microphone and sing a line or two and it would be awesome. Jann Arden did a recording of You Don’t Know Me for the soundtrack on My Best Friend’s Wedding. I tell the story on the show (I’ll have a link to the story here soon) of how much that recording meant to me during a rough time in my life. I think everyone has a Jann song for a rough time in their life. And I thought it would be the perfect song. First, the story of why I loved it is true, but it’s also not her song. She didn’t write it. So I wouldn’t be wrecking one of her own songs if I sang it. So I wouldn’t piss her off before I even started. And I could play it on the upright bass. Which is automatically funny. It’s funny looking. And I kind of know how to play the upright bass. Kind of. So I pitched the concept at a DKL meeting a few weeks before the show. I described how I’d tell the story of listening to the song, Then I’d tell her that I wanted to sing it for her. Then someone would bring out the upright bass and I’d say, “Sure I’ll use that”, everyone would laugh. Jann would laugh. Then I’d start singing the song. Then I’d say, “Russ you’ve played this song lots – why not play along?” and Russ Broom would start playing guitar, which would give Jann confidence that it wasn’t just me hacking the song to pieces. Then I’d start playing bass. And everyone would laugh harder. Jann would laugh… and then she’d come over for the second verse. Who could say no to that? Everyone loved the idea. It was going to work. Until I went and rented an upright bass to learn the song and realized it was harder than I thought. By a lot. There are no frets on an upright bass, so it’s easy to get lost and really off key the farther up the neck you go. And the more lost I got, the worse I sounded. I’d just have a conversation with Jann and everything would be fine. So I told everyone the idea was off. Mike, our executive producer, and Jason, our writer, said, “What?! Why?! It will be awesome!” They harangued me into at least practicing a bit more. So that night I got home and tried to play it again. And it was still terrible. So I said no again. For sure this time. By now the show was three days away. So two days before the show I dragged my rented standup bass to Russ’ studio and played… IN HIS STUDIO! And I sounded terrible. I was nervous, I couldn’t find my place on the bass. The further along the song went, the more lost I got. The notes were way off. And then Russ saved it all. It was a total cheat, beginners way to play. And a pro was telling me to do it. And he wasn’t. And so I did. And suddenly I could play the song. And not only did I put tape on the side of the neck, I put a tiny piece right ON THE FRETBOARD. I figured, if I’m going to cheat, why not cheat all the way? Have another look at the picture. Actually, here, I’ll blow it up for you. And some people might think it happened because Jann was kind enough to do it. That’s true. Or that Russ was kind enough to play the guitar. Also true. But I know the real reason. The only reason it actually happened is because Wayne Gretzky told me to use double bladed skates. He just called it masking tape.